Hi! I teach to pupils aged 6 to 50 in Argentina. 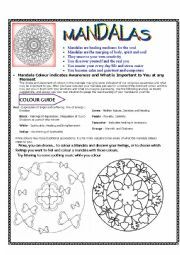 I find this site very useful and an excellent way of sharing my worksheets. This is a formula I give my pupils aged 9 to 60 and once they learn it by heart and realize how to use it , they avoid thinking in their mother tongue when they make questions or when they are being answered. I also made a poster with the formula and have it displayed above the whiteboard. But remember to cover it on test days!! 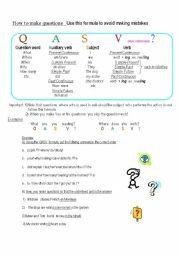 A set for making questions.Work in pairs activity. 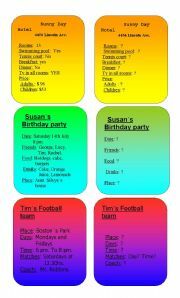 I made the flashcards in different colours so you can easily identify the couples. 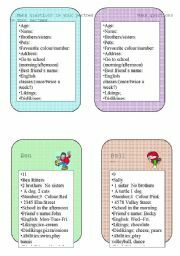 The pupils with the information flashcard have to answer to the questions that the other pupil makes to them, Great practice for Cambridge YLE , Ket and Pet exams. And kids and adults enjoy the activity. 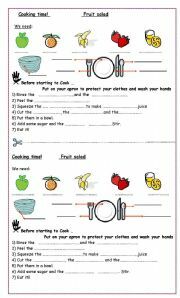 worksheet for making fruit salad in the classroom.Activity that I have used many times with my different groups. 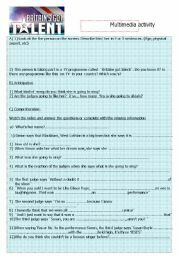 There are 2 worksheets per page. 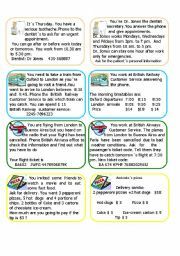 Key is provided on the second page with some tips that can be useful when doing the activity. I hope you´ll find it useful. This classic is loved by children, teens and even grown ups!! 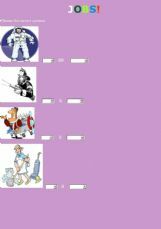 I replaced some words for pictures to help them deduce the words that are missing.I hope you´ll find it useful!. A tip; let them sing the song aloud at the end of the activity and give them some maracas or other things to make noise while they sing . Pupils will love it! What are these things made of ? Read the hints, Choose the letters to spell the material needed. 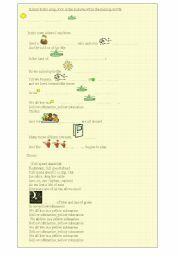 First of a serie of exercises on animals and their habitats and what they can or can´t do. 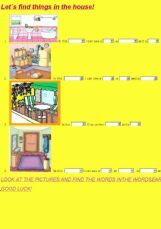 a very simple exercise to check some specific vocabulary. 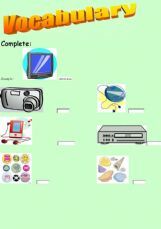 words used: camera, television, dvd player, cd player, mp3 player, badges, shells.